Posted on July 22nd, 2015 by Lorna Parsons and filed under BPN News, Community, Events. 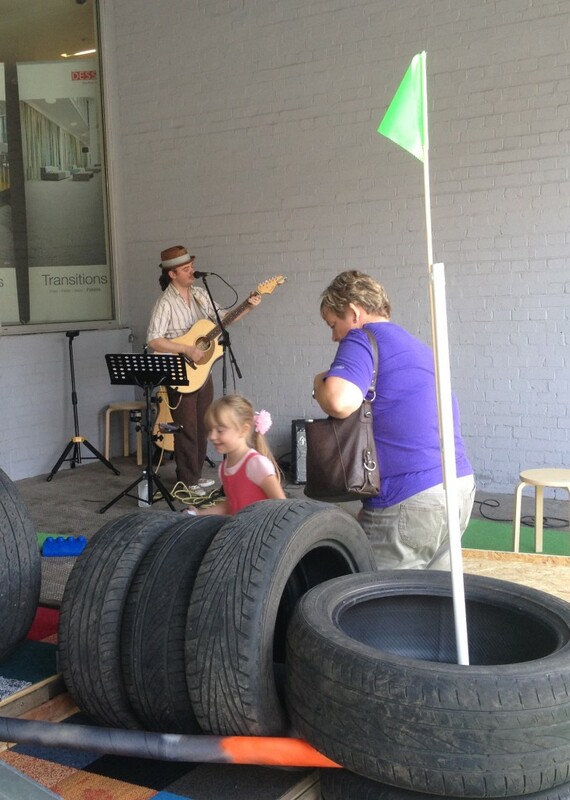 July 17th – 19th was the first ever Jewellery Quarter Festival. 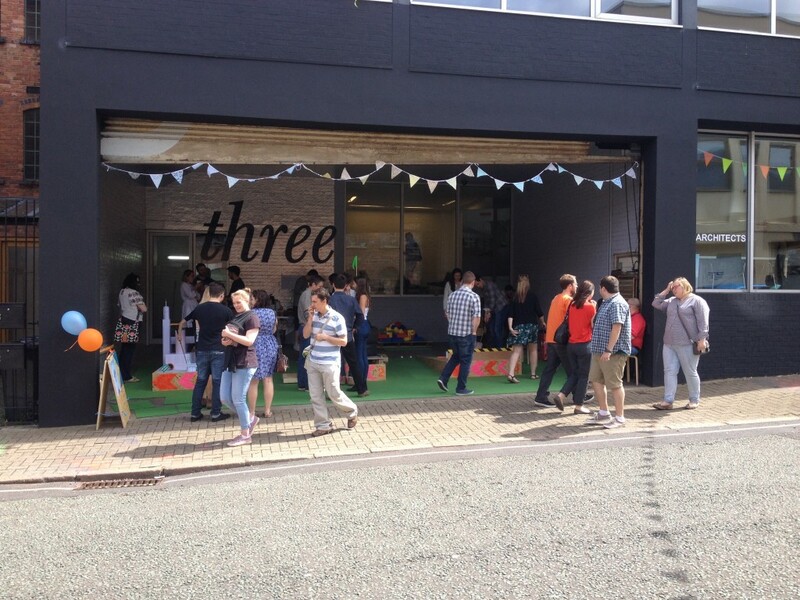 Organisers joined forces with the West Midlands Love Architecture festival and we took part in the Open Studios event. 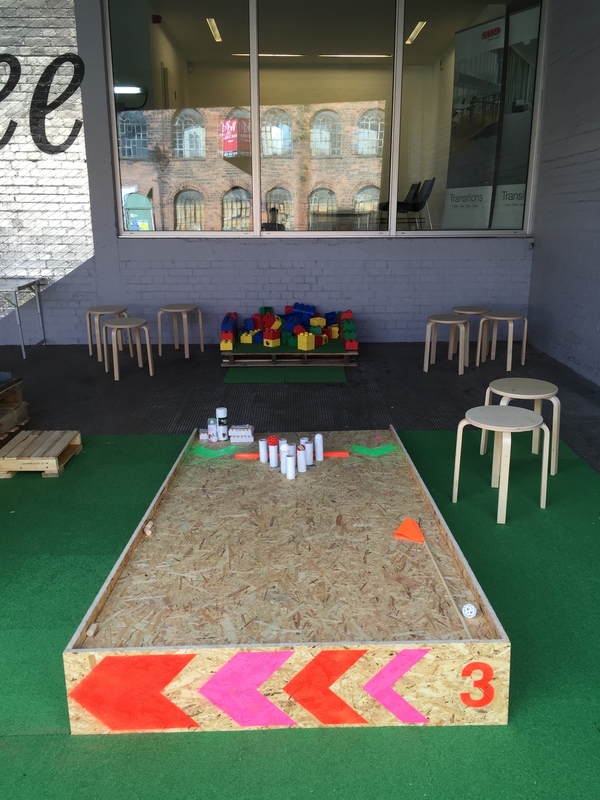 We pondered a few ideas for how we might engage with visitors and decided to go with what was probably our most outlandish idea of building a mini crazy golf course in the loading bay. Not satisfied with just that, we invited musicians to play live music for us and we made metres of bunting to make the place look a bit more cheery. 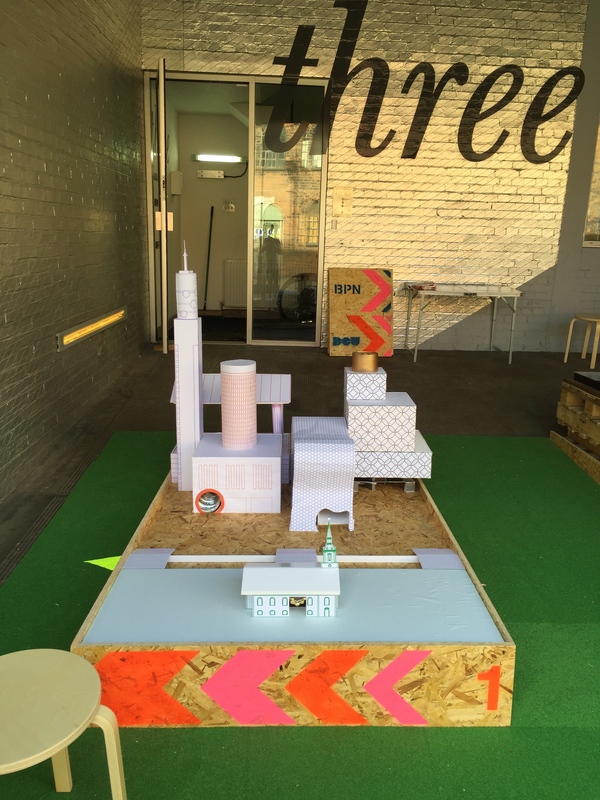 The self-professed “All Stars” went with an architecture theme and their putting hole featured a number of local landmarks. Players could choose from three starting points: through the new Library of Birmingham; via a tunnel through Selfridges; or by navigating a link between Birmingham’s town hall and the Rotunda. Once through the building of their choice, the ball had to travel across a “canal” of sweets and chocolate and in through the door of St Paul’s Church. This team probably win the prize for the most swearing during construction. 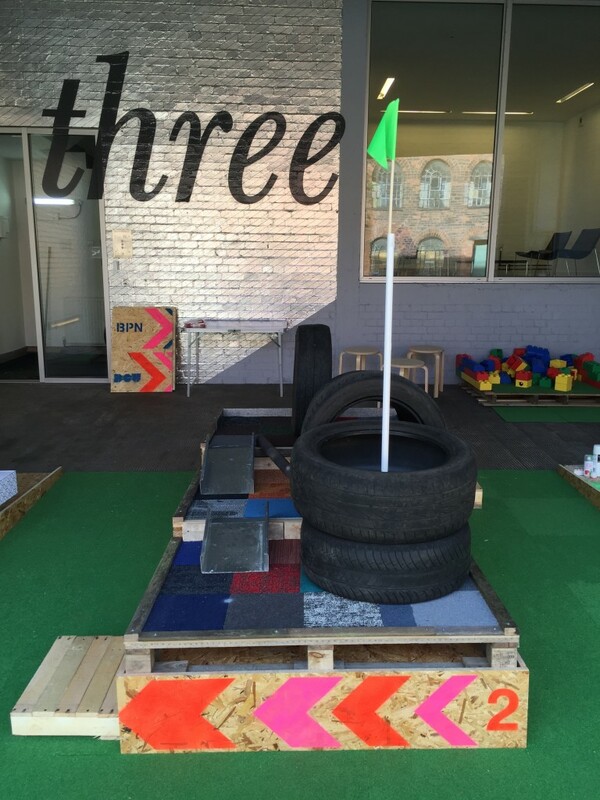 In the case of the team calling themselves “The Under 31s” (really), old pallets became a stepped structure with guttering guiding the players to the top and a series of car tyres and postal tubes providing a route direct to the flag. They finished off the ensemble with a patchwork putting surface using old carpet samples. It seemed ambitious on paper, but thanks to an array of power tools and macho grunting they pulled it out of the bag. And finally, the “A Team” (really??) took a twist on the basic premise of hitting a ball into a hole and created a new concept which combined golf with bowling (Gowling? Bolf?). Players had a choice of tee, but ultimately had to knock down as many toilet-roll skittles as possible with one whack of the ball. Not as easy as you might think as the ball had to be strategically ricocheted off the top section of the putting hole base. Coffee and cake was on offer to visitors, and we had some giant lego for budding architects courtesy of RIBA West Midlands. Live music was provided by 4 different local acts: Kathryn Marsh and Dave Sutherland, Alfie Newman (a very talented 16 year old guitarist and son of Richard Newman), Paul Parker-Duber (below), and Leah Fitzsimmons. 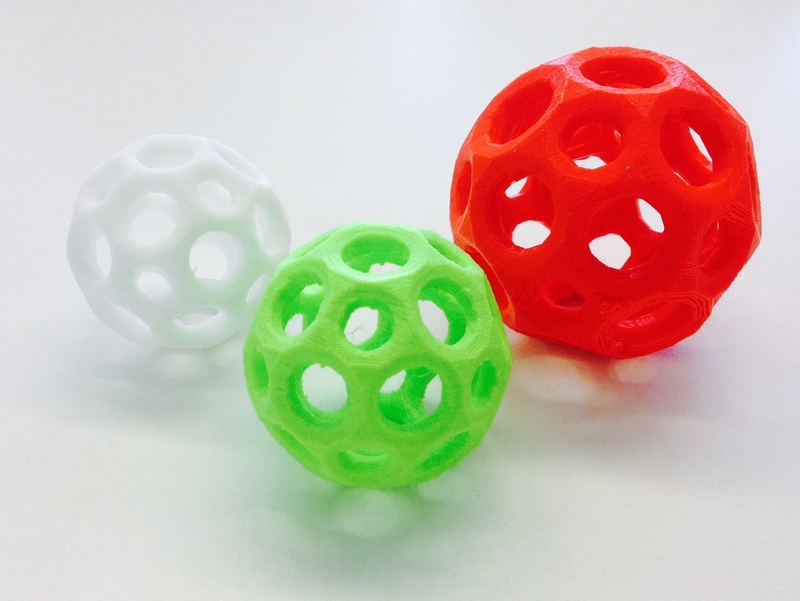 Black Country Atelier were kind enough to provide us with some rather special 3D printed golf balls.